Home / Products / Revenge End Link - Replacement Watch Strap Tailor-made for Rolex, Matte Brown Pull Up Leather, Military Green St.
"Revenge End Link" - Precision cast stainless steel end link tailor-made for 20mm lug size, 16mm clasp specific Rolex Oyster collection watch models. The manufacturing of "Revenge End Link" (NEP2 - made in Singapore) is very close to the original Rolex end link. Hence the mechanical property is almost the same, except the material is made of 316L instead of 914L. In other words the softer 316L is not abrasive to the case. "Revenge End Link" leather collection, a combination of "Revenge End Link" and sewn in Italian pull up vegetable tanned leather. This "Revenge End Link" not just filled up the embarrassing hollow space (lug) between case & leather strap but also create a perfect transition from Rolex case to leather strap. The collection was tapered to 16mm Rolex buckle size and was designed to fit on the last link (or any screw fixed links) of the Rolex Clasp on one side & adjustable screw fixed Rolex links on the other side. 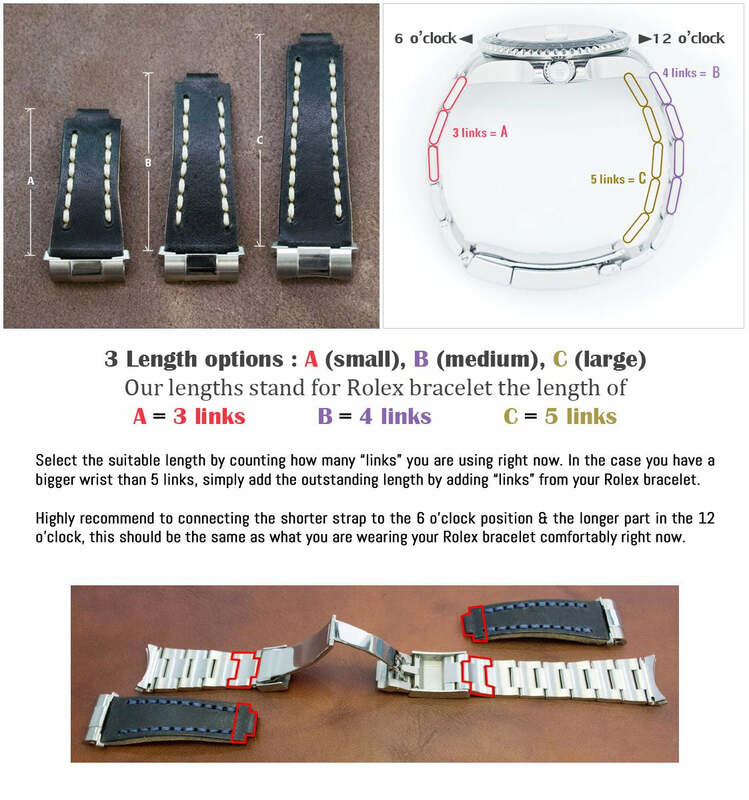 Therefore, there are no limitations to the overall length of the final watch strap as you can add numbers of Rolex links to it to extend the length you want. This is an innovative design to give your Rolex an option of smart casual style and looks different than others. Select the suitable length by counting how many "links" you are using right now. In the case you have a bigger wrist than 5 links, simply add the outstanding length by adding "links" from your Rolex bracelet. Highly recommend to connecting the shorter strap to the 6 o'clock position & the longer part in the 12 o'clock, this should be the same as what you are wearing your Rolex bracelet comfortably right now.